One of the most frequently asked questions a bridal consultant is asked usually revolves around what silhouette looks best on a specific body type. While there are no hard and fast rules regarding what will highlight a bride’s personal attributes, there are some general guidelines that may help you through the process of finding that perfect dress when you start your gown search. First thing is that you need a caring consultant, equipped with the desire and experience to helping you. You are unique! Our team of stylists care about the individuality of each and every bride and know that there are many factors to consider when purchasing the most important and meaningful garment of your life. Petite sized brides tend to measure under 5’3 in height. They require a more proportional fit in clothing to accommodate their smaller frames. 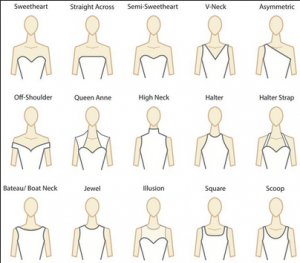 Sadly for petite brides, most manufacturers cut their gowns for women who are 5’8 and above. (The idea being that it’s easier to cut and hem a gown rather than try to add more to the hemline.) And, while many manufacturers offer a gown length measurement for petite brides, gown length services may come with additional charges attached. While a perfectly petite stature may require some consideration when choosing a gown, it doesn’t have to be an obstacle. A particular consideration for the petite bride is silhouette choice. Ball gowns, drop-waisted, full skirts and mermaid gowns tend to use layers of material to achieve a voluminous look. The petite bride will want to be discerning when choosing one of these silhouettes since sometimes the bigger gowns with tulle, lace and crinoline underskirts may overwhelm a smaller frame. The petite bride may want to consider a sheath, fit and flare or a modified mermaid. These gowns give the illusion of an elongated frame. Trying to avoid a gown with heavy hem lace or horsehair finish also goes a long way toward lengthening your appearance. These types of finishes on a gown tend to give a definitive end point to the gown, which draws the eye. Fit and flare or mermaid gowns can be worn with confidence by a petite bride as long as the volume of the skirt is held to a minimum. This bride may also want to consider an empire waist or v-neckline. Both these design elements further enhance the illusion of an elongated frame. For the longest time in the bridal industry, it seemed that curvy brides were relegated to search among the back racks of a salon looking for their perfect dress. Rarely were they able to try on samples that actually fit let alone be given any kind of color or style choice. Thankfully, those days have been thrown to the wayside along with the corset, white gloves and pill box hat. The bridal industry has not only taken notice of your glorious curves, but they are now catering specifically to your needs. As a consultant at Darianna Bridal & Tuxedo, I am always thrilled when I can just grab a dozen different gorgeous dresses from our gallery in all different silhouettes for my curvy bride to consider during her appointment. Being a curvy bride can come with pitfalls much like their petite bride counterparts. Rather than being vertically challenged, curvy brides may be challenged with generous bust lines or rounded hips paired with smaller waist lines. Curvy brides navigate between wanting to perhaps slim down certain aspects of their silhouettes while enhancing others. This can be achieved without compromising on the beauty of a gown. Generally, curvy brides will gravitate toward A-line gowns. The waist is well-defined and the overall hour glass silhouette complements the figure. While A-line gowns are beautiful and well suited to a curvier body type, there are many more choices available to this bride. The Fit and Flare silhouette are fabulous for highlighting a curvy bride’s assets to the fullest! The body hugging nature of a fit and flare accentuates a smaller waistline while putting those curves on display. Modifying the skirt volume so that it doesn’t overwhelm your frame is key to this look. A basque waistline (waistline drops well below the hip line) is also a marvelous choice for this bride. Once again, it defines the hourglass nature of the body. Usually a basque-wasited dress will be paired with a tulle or English net skirt to complete the silhouette. Also, never underestimate belt accessories as an addition to any bridal look. Belts and colored ribbon are always a great way to add a little sparkle or color to a gown but also act as a focal point to the bride’s smaller waist. Gown types that may not be as figure-friendly to our curvy bride would be a sheath, mermaid or massive ball gown bottoms. The sheath and mermaid gowns can sometimes appear to be overly restrictive on the figure and accentuate a look that you’d prefer to avoid. Voluminous skirts, while thought to have a concealing effect several decades ago, actually may do the opposite to a curvy or fuller-figured bride. Another consideration for our curvy bride when choosing a gown is to consider her bust proportions. The best gown will define the bust line and accommodate your bust size rather than make you look and feel uncovered. When your breasts are not properly supported in your gown, it throws off the silhouette of your gown. With designers now intentionally designing gowns for the curvy girl rather than just making bigger sized versions of their basic line, they have tackled this problem by incorporating better foundation structure in their gowns. You may now see more corset boning in the gown to help support the bust line or possibly elastic bands sewn into the bodice to help provide support and stability where it’s most needed. Specific necklines will also help those who may need a little extra support. A jewel, bateau (boat), Queen Anne or tank neckline will always provide more support and structure for those who have fuller bust lines and need more structure. V-necks are perfect (and very flattering!) way to keep everything in place. Strapless is still a beautiful and viable option as long as the bra cup within the dress is large enough to accommodate your breasts. Also, never be afraid to employ fashion tape to keep everything where it should be. It is a translucent adhesive tape designed to adhere your dress to your body. Much like her counterpart brides, the long and lean bride has some unique needs as well. Oftentimes these brides are well above the average 5’4 woman which means they may require extra length added to their dresses. While it is true that manufacturers cut a gown for a 5’8 tall woman, if that bride wishes to wear a heel at her wedding that will put her over the industry standard. Contrary to her curvy counterpart, the lean bride tends to be less endowed in the bust area, which may lead to less definition in her gown’s bodice. These statuesque brides may wish to create the illusion of more curves and a fuller bust line to their look. As with our other clients, we can address these concerns with specific gown design. While it may be true that the long and lean bride can wear a larger variety of silhouettes, there are still some styles that should possibly be left out of the mix. A fit and flare or mermaid style are designed to highlight body contours which our long and lean brides may not possess in abundant measure. Also, while a sheath helps elongate the frame, that may not be the goal of our taller ladies. And, conversely of the petite bride, hem lace or horsehair finishes at the bottom of your gown can work in your favor. An excellent silhouette to consider for those lean brides may be a full-on ball gown. Their overall height enhances the overall effect of a ball gown and also boosts the illusion of a fuller hip line. Many ball gowns are designed with strapless bodices or with spaghetti straps, which work well for those girls who don’t struggle for control over their bust lines. Natural waisted gowns with body contour embellishments such as curved vertical laces or beading will give the impression of a fuller figure. Unlike their curvy counterparts, the long and lean bride doesn’t necessarily need to focus on foundational support for her bust. Rather, she needs to highlight and define her bust line. This can be easily accomplished with the use of cups sewn into the dress or body sculpting adhesive push up cups. All things considered, your gown should be as unique as the love between you and your fiancé. The guidelines I’ve provided you with are just that….general. You will have so many beautiful gowns from which to choose. Your ultimate goal is to find that gown that compliments your personality, aesthetic and body type. It also needs to be comfortable and not restrictive to movement as your wedding day will be long. There will also be varying opinions and consultation with your support squad, but in the end it truly only comes down to your thoughts and feelings about the dress. You and your soul mate will be taking that wedding album out every year on your anniversary, it is a day that will never fade from your consciousness. As a consultant, I have seen so many phenomenal gowns, but I never associate a right or wrong choice when I’m working with a bride. To me it’s like choosing a rose. The flower is inherently beautiful. You just need to find the one that best expresses your unique beauty.